February is American Heart Month, so we talked with respected cardiologist and author Nieca Goldberg, MD. She shared her expert advice on the steps every woman should take to lower her risk of developing heart disease, the number one cause of death for women in the U.S.
Dr. Goldberg is a nationally recognized pioneer in women’s heart health. She is medical director of the Women’s Heart Program at NYU Langone Medical Center, medical director of the Joan H. Tisch Center for Women’s Health, and clinical associate professor of Medicine, in the Division of Cardiology at the NYU School of Medicine. Dr. Goldberg is the Co-Medical Director of the 92nd Street Y’s Cardiac Rehabilitation Program and a national spokesperson for the American Heart Association’s “Go Red” for women campaign. She is the author of three books on women’s health. A graduate of Barnard College and SUNY Downstate Medical Center, Brooklyn, she completed her medical residency at St. Luke’s-Roosevelt Hospital Center and a cardiology fellowship at SUNY Downstate. Q: Do you think most women know what factors can affect their risk of heart disease? Nieca Goldberg, MD (NG): Women know a lot about the traditional risk factors—high blood pressure, elevated cholesterol levels, diabetes—but there are other risk markers that fewer women are aware of that can also increase risk of cardiovascular disease, for example, autoimmune diseases such as lupus and rheumatoid arthritis. Pregnancy-related conditions can also increase your risk. Pregnancy-related hypertension, pre-eclampsia and gestational diabetes are linked to an increased risk of heart disease, stroke and type 2 diabetes later in life. 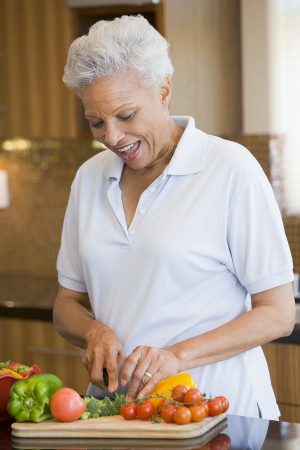 Q: What steps should women take to prevent heart disease, or, if they’ve already been diagnosed with heart disease, to improve their cardiovascular health? NG: Don’t smoke or quit smoking. Smoking has a significant impact on your cardiovascular health. It lowers your blood levels of good cholesterol and raises your levels of bad cholesterol. Smoking causes menopause to occur three years earlier, which in turn lowers your levels of heart protective hormones. Physical activity is also very important. Taking a moderate pace walk 30 minutes a day/ seven days a week lowers your risk of cardiovascular disease up to 50 percent. By moderate pace, we mean that you should be short of breath, but still able to carry on a conversation. If you’re already fairly fit, you’ll need to increase your pace or include stairs or hills in your walk to achieve the right level of effort. Research has shown that you get the greatest heart benefits from antioxidants in food rather than supplements, so I recommend that my patients follow the Mediterranean diet, which is low in meats and sweets and high in whole grains, low-fat protein and antioxidant-rich fruits and vegetables. I also think a yearly physical is important. I’m a big proponent of staying in touch with your doctor and keeping those lines of communication open. If one of my patient’s cholesterol levels are up, I’ll send a secure email to check and see if she’s taking her prescribed medication regularly or if she has questions about what steps she can take to lower her cholesterol in addition to taking the medication. Q: What roadblocks keep women from taking steps to lower their heart disease risk? NG: People are busy and feel like they don’t have time to exercise or cook. They’re in a hurry to lose weight and get discouraged when they don’t see results quickly. The fact is, healthy weight loss takes time. To lose one pound per week, you need to cut 500 calories a day. That’s not as hard as it sounds, since you can do it by cutting back on the calories you eat and burning calories through exercise. The best advice is that small steps make a difference. Learn how a health advisors can help you make sure you’re following the right path for cardiovascular health at every age.